I have been an avid ST fan for several years (even though I don’t do WW, just prefer healthy options) and I solely make Skinnytaste recipes in my house. My husband (and guests) love them all! Another tasty recipe! I’m amazed how flavorful all the recipes have been. Flavorful and healthy…can’t ask for more! Made the Skinny Blue Cheese Dressing to go with and it was spot on! I really liked the ease of this dish. I got my buffalo fix with out the guilt. The blue cheese dressing was sooo yummy. Will definitely be making this again. These were excellent! Juicy and Frank’s was perfect flavor. I made just as the recipe said except I did cook the chicken in the sauce for a few minutes which was a good idea by other posters. Will be making this again for sure. I also used Bolthouse blue cheese, a good lite bottled dressing. Today is Super Bowl Sunday… just made this and husband and 26 year old son just gave it a thumbs up! High praise indeed! Great recipe and so easy and quick… the best part (for me) was the blue cheese dressing! I’ll make that again. And again. And again! Quick and Delish ! Served it with the Skinny Blue Cheese Dressing. Prep time for both was about 30 minutes and another 10 for cooking the chicken! One of my very first SkinnyTaste recipes. I love making this because it’s so easy and perfect for mealprep. I always have a serving of lite sour cream and some raw veggies on the side! Don’t feel like cooking? If you have the ingredients on-hand, dinner is on-the-table in less time than driving to your favorite fast-food. Brush on hot sauce and broil to finish. Adjust seasoning and hot sauce to taste. Include skinnytaste honey-mustard dip for variety. Delicious, quick, and the kids like it too! This was delicious and my family loved it. We made buffalo chicken salads This is a keeper and I will definitely be making it again soon! So easy, and the family loved them! I’m now making a triple batch, because with 2 teenage boys, it will be good to have a bunch in the fridge for after school snacking! By the way, I wrapped mine in a high fiber tortilla with some garlic mashed potatoes, topped with your skinny blue cheese dressing. Yumm! I’m surprised this is not listed as whole30! Franks red hot is complaint! 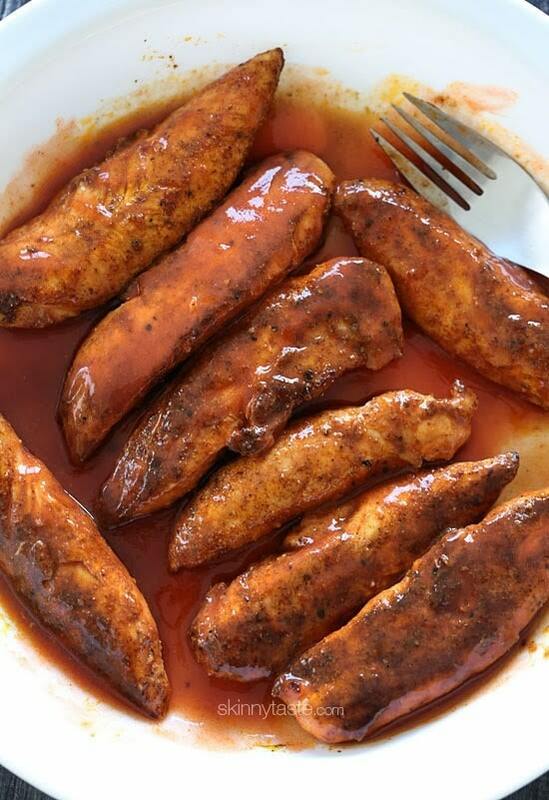 I made these Buffalo strips for supper tonight; they were as good as any Buffalo wings I’ve had elsewhere. And, I could be “messy’ in the comfort of my own home! Thank you for such a wonderful recipe. Best. Recipe. Ever. We serve it with the ranch bolthouse dressing. Perfection. I made this tonight with cauliflower rice and spinach on the side. Omg so good! I had to use a little more oil but I dabbed it once I Came out so hopefully that cut back some of the unhealthiness it added. 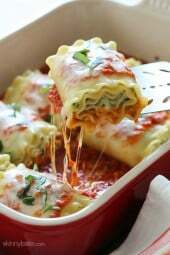 I tried this recipe tonight and it was awesome! I did bake them after I added the sauce and used Texas Pete and melted butter for my sauce since I don’t like Frank’s. Definitely a winner! Thank you! I’m really excited to make this tomorrow! I’m going to cut the strips up over a tossed salad with your homemade buttermilk ranch dressing! So excited! Oooooh. I need a crockpot version of this. I love shredded chicken on my salad. I guess I could do the seasoning, make it in the crockpot and then add the hot sauce after and then shread the chicken? I'm so weird when it comes to food. I annoy myself. I make a variation of this using smoked paprika. It gives an added smoky flavour. I made this for dinner tonight. So good! I don't tend to make the same meal twice (with few exceptions). My husband joked 'this was one of the best different meals that he will never get again'. I promised to make it again bc it is so simple and I always have these ingredients on hand. 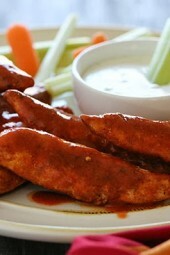 We made this last night to eat during the National Championship as a healthier alternative to chicken wings. Ate with roasted potatoes and spinach. My family loved these! I was surprised salt wasn't in the recipe, but after tasting the finished product, realized it's not necessary at all. I served with a slaw made of broccoli slaw dressed in Gina's Creamy Cilantro Tomatillo sauce, carrot & celery sticks, and some oven fries. Would also be good with Cauliflower or Broccoli Tots on the side. The seasonings and sauce could be used on chicken breasts or maybe even fish, and served over a salad or on a bun. Definitely a keeper! 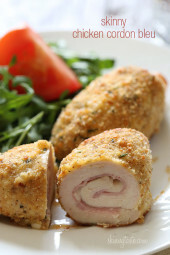 I loved this recipe and used perdue thin breasts instead of the tenderloins. Would you count each breast as 1 serving? Sounds delicious!! Pinned to try! I put half a serving on a salad! Made these the other night and grilled them, WOW. Thought I made enough for leftovers but was sadly mistaken. I LOVE THESE! I make Buffalo chicken wraps that are now way healthier than the fried ones you can get! Just made these for my husband and he LOVED it! I added a little onion salt to the dry ingredients since he really likes onions, but kept everything else about the same. GREAT recipe! I now have a very happy husband! I just made these. i mistakenly mixed the hot sauce with the dry ingredient so i grilled them instead, they were yummy. great salad accouterments. I made this for dinner tonight, and it turned out really well! I will definitely be making it again. Here is the link to the post on my blog if you'd like! Making this as a slow cooker version with tempeh instead of chicken. Tossing the cubes in some 4-point vegan mac and cheese. It's about to get very very real in this kitchen. OMG… I made these and made Buffalo Chicken wraps with whole wheat tortillas, Spring Mix lettuce and Lowfat Mozzarella. Way better than the one I would get at the Diner that was fried chicken strips, white tortilla and iceberg. I am in LOVE! 7 points total! I cannot use non-stick on my stovetop, so I put in oven at 450. Delicious. Thank you for developing an alternative to fried wings. My husband and I both enjoyed them. This was so good. I use to make wings with the breading, this way is so much leaner and the taste is still all there. This was AMAZING!!! WE WILL DO THIS RECIPE WEEKLEY! Thanks so much! I wanted to let you know normally my superbowl would have been filled with lots and lots of junk but thanks to you my entire family enjoyed these strips, your baked mozzarella sticks and your hot spinach dip. It was all absolutely amazing and made me feel like I was cheating even though I wasn't. Thank you so much!! 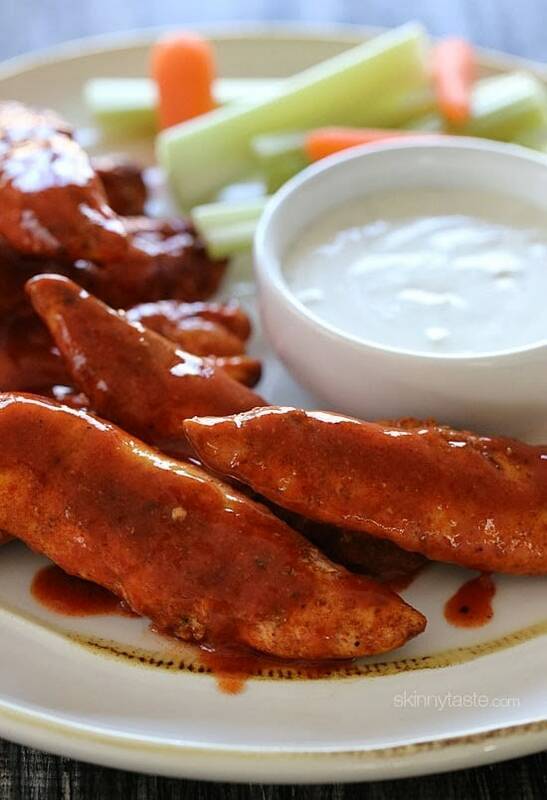 We live in Western New York, so we know a thing or two about wings and tenders plus blue cheese dressing. These chicken tenders were excellent, and fairly simple to prepare; we in our empty nest have plenty of leftovers for tomorrow – which is always a bonus. I am grateful I found you, Gina, and Skinny Taste; each recipe I have tried has been excellent, fun to make, and rewarding to eat – no guilt. Thank you. I would like to know if you could bake these instead of frying them? I would like to know that too! I have a recipe where you can bake the tenderloins at 375 for 15 minutes or until they are no longer pink on the inside. I may try that with this recipe. Made Buffalo Chicken Salad… WONDERFUL! This recipe is so easy and tasty to boot! Thanks for the great recipe! My husband wanted wings… I wanted to stay on track with my weight loss goals… So I came to my favorite site! LOVED this. Gina, you are awesome! I love that I can feed my family real food and all of us can be healthy. Thank you! I made this last night and served over a crisp salad. Delicious!! I'm already thinking about when to make these again. Ditto on the cookbook comment from Katrina. I made this last night for my husband, and it was a huge hit! It will definitely become a regular in our house. I can't tell you how much I appreciate your blog – every single recipe i have made from your site has become a family favorite! Its so nice to know I have a place to come to find delicious and healthy recipes – I can't wait for your cookbook! Thank you so much! I am addicted. I have made them 4 times already and cannot get enough!! I made this last night and it was delicious! The only thing that I did differently was to put the hot sauce on the chicken while it was still in the frying pan so that it glazed the chicken. Mmmmm…. this is delicious! I eat this sometimes and I love buffon chicken strips. I eat this always with some tortilla chips. What do you guys and girls serve with it? Just wanted to let you know that I made these last night and they were a huge hit. I grilled them up on my pannini grill for those great grill marks, served with some mashed potatoes and peas. Definitely going into our rotation for recipes! Thanks! Guess I shall go to lunch now, would anyone like to stop by and join? Thanks for the easy-to-fix idea, cheers! Great Super Bowl recipe. Thanks! 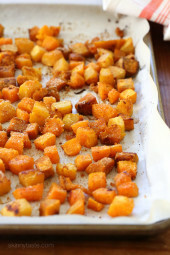 Awesome recipe and so easy to make & absolutely delicious! Thanks Gina for all your terrific recipes! I made this for lunch – it was so good! Thank you for this recipe! I used the hot sauce in my fridge (not Frank's) and it worked well. This sounds simple and delicious, can't wait to try it! I only have Frank's Wing Sauce in my pantry right now – if I use that instead, should I leave out the extra spices? This looks so yummy!! It should be fine as is. I am from australia and we don't have franks hot sauce…well I don't think we do…what is it? and do you know of a sub that I can use? It's cayenne pepper sauce, it made from cayenne peppers, vinegar, garlic powder and salt. Made these tonight, they were so good! It made me realize though that I think my stove top runs hot (it's an electric stove), I had to dial the burner down a notch below medium to get it to cook all the way through without burning the outside of the chicken, but once I got it 'calibrated' it was PERFECT! Very excited to add this to my regular cooking rotation, and I bet it would be great cut up and put into salad as well. Yes, all stoves are different, even my burners on the same stove cook different. It sure would! Made the Buffalo Chicken and the baked fries today. So much fun cooking with all of the spices! I was really a fan of the fact that it didn't require two different temperatures of baking, but instead baking and pan cooking. So glad you are enjoying the recipe Peter! This is delicious… Made it 2 nights in a row! Never heard of Franks. Do most stores carry it? Yes. Definitely the most common hot sauce here in the Midwest! Yes, everyone carries it but you can use another brand. what if I don't live in the Midwest or, indeed, America? Is there an English equivalent, please? I'm sure if you can't find it, you can order it online. It's a very common hot sauce here, but if you are outside of America then I am not sure. Try Amazon. It's the most common hot sauce, period! How can you never have heard of Franks?? Had no idea you had so many other buffalo recipes. Glad I stumbled onto this one! Going to serve it up this weekend. 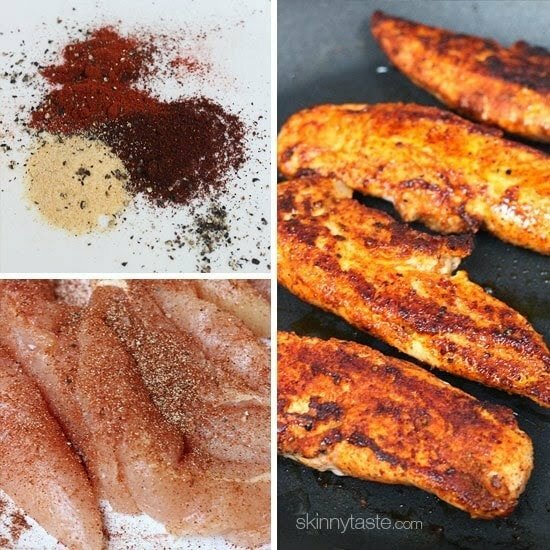 I have no tenders, how would you recommend cutting up the chicken breasts: strips or cubes? Doesn't really matter, it will still taste great as cubes! I make something similar but I grill the chicken on my george foreman grill instead. And I do use the Frank's Buffalo sauce too. I was going to make the Buffalo Cauliflower Bites and I bought the Frank's Buffalo sauce because I couldn't remember whether it was that or the plain sauce on the recipe. Have you used the Franks Buffalo sauce before? I'm not sure if it has more calories, I would check the labels. Is there a substitute for Franks Hot Sauce? Or is there a mild version? These actually look like eating them with just the spices would be yummy. My husband has tummy difficulties with spicy foods but I want to try these. The only reason I like football is for the food! These will be on my table this 'football' Sunday for sure! Could you do bbq instead of buffalo? If so would there be a point difference? Sure, why not. I'm not sure if the sugar from bbq sauce will increase the points. Made it tonight and put it on a salad…great! Thank you! These look delicious! 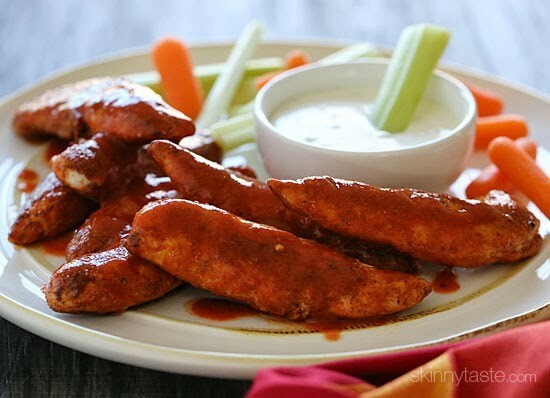 I love buffalo chicken! Who doesn't love buffalo chicken!?! Love this skinny version! OMG i'm so making this. Mmmm… I'm thinking buffalo chicken pizza. These look SO good! I think I'll make them for dinner soon. My Hubby will love 'em too. Thanks for sharing your recipe! I'm going to check out some more. Yummy- this looks delicious! Definitely will be making these for our next game day party at our house! My son will love these! 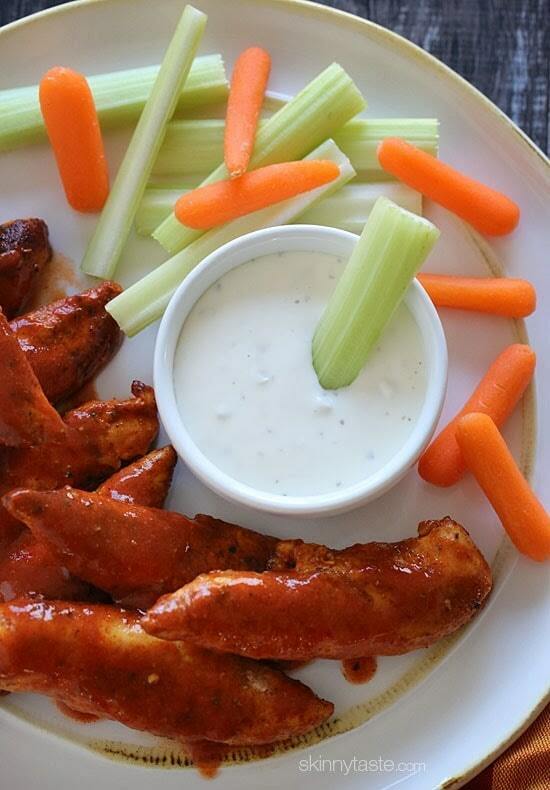 Thanks for another great recipe using buffalo sauce flavors! Yum! Definitely trying this soon. You are correct and I am confused as well–that will also throw off the points and nutrition info. Thank you – I have the same question. I just fixed it, thanks for letting me know! It's 4 servings 2 strips. Oh my goodness! These chicken strips look so, so delicious!! I am seriously drooling here…. Pinned this recipe and intend to try it soon 😉 Thanks! I've been waiting for Buffalo Chicken! I'm so excited to try this! Do you think if I add the hot sauce while its cooking that it won't be as messy? Add it after it cooks so you get a good sear on the chicken. Add it later and then put them under the broiler for a few minutes. That will help the messy factor. I have a friend who puts them in the pizza oven to "dry" the hot sauce in his restaurant. This is the best way to do it. It thickens up and sticks to the chicken like a proper wing. I cook all the chicken first, then add is all back into the hot pan at the end and toss with the hot sauce and let it thicken up. The franks gets a little salty as it reduces down just keep that in mind as you season your chicken. (Make sure you use a nonstick pan). I also use spray coconut oil to minimize the amount of oil ii introduce.